The first of these appears to be a bullet we have dodged, for now. New technologies such as the controversial hydraulic fracturing (“fracking”) and horizontal drilling have allowed for the development of natural gas and oil previously trapped in “tight” rock formations. After decades of conflict, Iraq is set to greatly expand its oil production to become the second largest supplier by 2030, and it is the primary supplier to an expanding Asian and Chinese market. And we still hold ample reserves of coal. Great news, right? Not so fast. Burning all of this coal, gas and oil would result in a climate disaster. Changing patterns of drought and rain and more frequent and intense storms will hit agriculture, ecosystems and biodiversity hard; sea level rise will impact coastal cities; while ocean acidification will have serious effects on the organisms at the base of the ocean’s food chains. The International Energy Agency (IEA) states that no more than one-third of known fossil fuels can be burned if we are to hold global warming to less than 2ºC, which is the limit the International Panel on Climate Change recommends to avoid “dangerous” climate change. We have to choose to leave the other two-thirds in the ground. And this will be a difficult choice to make. World energy demand is not decreasing, but increasing, rapidly, and is expected to grow by one-third in the next 20 years. Most of this growth will happen in developing countries, particularly China, India and the Middle East. Wealthy countries may be able to reduce their carbon footprint by using less energy, but this is not part of the plan for people who lack access to electricity or gas for cooking, lighting and other basic amenities. So our grand challenge is to find ways to produce energy with little or no greenhouse gases that can substitute for the ways we use fossil fuels and are cheap enough and can be built fast enough to have a meaningful impact on climate change. Can we do it? Let’s take a look at the energy trends over the next several decades, mainly from the point of view of the IEA. We’ll just look at electricity, which makes up only one-seventh of overall energy use – a fraction of our total energy consumption. Energy is the capacity to do something – to move a truck, to heat a room, to press steel or fire a brick. Physicists normally measure energy in joules – it takes about 1 Joule (J) to lift an apple 1 metre. Power is the rate at which a generator can make energy – at 1 J/sec the power is 1 Watt (W). An apple-lifting machine that lifts one apple per second would need a 1 W engine to power it. It doesn’t take much energy or power to lift apples. It does take a huge amount of both to run whole cities and countries. A recent World Bank report tells us that in Australia each person uses a bit over 1000 W of electricity, on average. So a city of a million people needs a thousand million watts, or 1 gigawatt (GW). 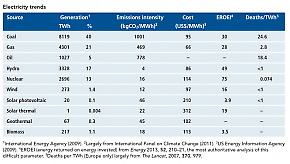 The largest thermal power stations – big coal plants or nuclear plants – make about 1 GW. There is about 5000 GW of electrical power plants in the world. Australia has about 54 GW. So if we want to transform our energy supply, we need to be talking about gigawatts and tens of terawatt hours. Smaller quantities will not move the needle. Arresting our greenhouse gas production will take every low carbon energy source we can build – principally hydroelectricity, wind and solar power, nuclear power and, to a degree, natural gas. Natural gas is often promoted as a clean fuel. But it is a fossil fuel and produces a lot of carbon dioxide, albeit only about half as much as coal. Replacing coal plants with gas would reduce carbon dioxide emissions by no more than half. Even this is optimistic because of gas leakage during production and distribution. Natural gas is a very potent greenhouse gas – up to 100 times more potent than carbon dioxide. Australian climate researcher Tom Wigley has found that with 2% leakage, natural gas is no better than coal for our climate. Researchers at the US National Oceanic and Atmospheric Administration are reporting gas leakage rates of 4–9%. If this is indeed true, natural gas is an even worse emitter than coal. Hydroelectricity has the lowest emissions of any power source, but can only be built where landforms allow suitable dams to be built. And there is a large environmental impact from flooding large areas of land. With these constraints, the IEA anticipates hydroelectricity could at most double by 2035. The largest growth in renewable energy is expected to come from wind power. The IEA anticipates the addition of about 2339 TWh of wind power by 2035, bringing the total to about 2681 TWh, or 7% of global electricity. Solar power is also predicted to increase, but not as much. There are two ways to use solar power to produce electricity. Photovoltaic cells (solar panels) convert light directly to electricity, while concentrating solar thermal power uses mirrors to focus sunlight to boil water and drive a turbine. Photovoltaic power is projected to show very impressive growth to 26 times its present value. Unfortunately there is not very much to start with, and the final contribution is only 842 TWh, or just 2.3% of global electricity. Solar thermal is smaller still at only 0.7%. 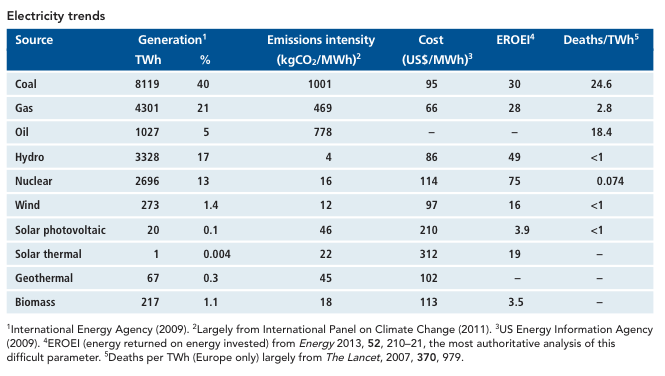 Why do wind and solar make up about only about 10% of electricity in this projection? There are a few reasons, but chief among them is the fact that we have no control over the weather or the seasons. Solar power does not work well in winter with its short days, or at all at night. Wind power is beset by calm days. Solar and wind are both highly variable, as clouds pass in front of the sun and wind rises and falls. This makes it difficult to construct a stable power supply unless you have backup power or energy storage. Energy storage at the required scale is difficult. The only energy storage technology currently available in the gigawatt range is pumped hydroelectric storage, in which energy is stored by pumping water uphill into a dam and recovered by letting it flow back downhill, driving a turbine to produce electricity. Australia has two pumped hydro storage facilities, with a combined power of 2 GW, capable of storing 4300 MWh each day. These are pumped up after midnight for 5–6 hours, and then supply power during the day. They could provide full power for a bit over 2 hours each day. To put these figures in perspective, we need about 450,000 MWh of electricity to meet our demand for one night. Our current energy storage is only about 1% of this – we’d need to build 100 times as much dam capacity to store a night-time of energy. Some solar thermal power plants store energy in the form of heat in hot molten salts. Most of these plants are in Spain and store about 8 hours of power, which sufficient for a night but not a night followed by a cloudy day. Worldwide there is not quite 1 GW of solar thermal power with this kind of storage, and with electricity costing around three times as much as alternatives they will probably not grow quickly. Similarly, wind turbine manufacturers are beginning to build batteries into turbines to store electricity, such as the General Electric “Brilliant” series of 2.5 MW turbines that come with 50 KWh batteries. This corresponds to about 1 minute of storage, which allows smoothing out moment-by-moment fluctuations in the wind but not the many hours or days that would be needed to cover extended lulls. Batteries are currently too expensive to contemplate for this kind of storage, at about $1 billion per hour for a 1 GW power plant. Other storage technologies are on the drawing board, such as pumping air into large underwater balloons or pressurised caves, or spinning up large flywheels, but these are experimental. If they are ever developed it will be many years in the future. In practice, the reliability of wind and solar power will mostly be ensured by natural gas. The one form of low-emission electricity that does not require extensive storage is nuclear power. When all emissions are included, from mining through construction and eventually decommissioning, nuclear power, wind and solar thermal power produce about the same amount of greenhouse gases per unit of electricity, and about 1–2% that of coal. Because the output is controllable, nuclear plants can replace coal plants more or less directly, which makes them a very powerful emissions reduction tool. Nuclear power produces 13% of the world’s electricity, and while the IEA expects a 60% increase in nuclear power generation by 2035, other energy sources grow faster. This is mainly due to economics – while nuclear electricity is very competitive over the long run, the initial costs are high, especially compared with natural gas. The calamity at Fukushima has led some countries to scale back or pause their nuclear programs, and refocused attention on nuclear safety. Germany intends to close all its nuclear reactors by 2022, for instance, and China has stopped building inland nuclear plants for fear of lack of access to cooling water in the event of an accident. The risk of accidents is one concern holding back broad acceptance of nuclear power. Modern reactors, like those China is currently building, have robust passive safety systems – cooling systems and the like that operate from simple physical principles without human intervention or external power. The events that caused the core damage at Chernobyl, Three Mile Island and Fukushima can’t occur in these designs, which are believed to be very safe. The risks from nuclear power should be put in some perspective. One way to do this objectively is to ask the morbid question: “How many people died to bring you 1 TWh of electricity?” For coal power the answer is about 18 people, partly from mining and construction, but mostly from the respiratory effects of air pollution. For nuclear power only 0.074 of a person had to die to bring you the same amount of electricity (including all deaths associated with or anticipated for the Chernobyl, Three Mile Island and Fukushima disasters). The figures for wind and solar are similar. Another key concern is nuclear waste disposal. Waste from current reactors takes about ten million years for its radioactivity to decay to the level of the rock it was mined from. In these reactors a nuclear chain reaction is driven by slow neutrons, which are captured by atomic nuclei creating radioactive heavy elements with long half-lives that end up as waste. But in a new generation of “fast” reactors, fission is driven by fast neutrons that can split the heavy nuclei into lighter ones with short half-lives. Fast reactor waste decays to background levels in about 400 years, so it is readily managed. In fact, fast reactors can use our existing nuclear waste as fuel, producing energy and eliminating the long-lived waste in the process. No such reactors are operating commercially, but the UK government is considering building one to dispose of its large stockpile of radioactive waste. There is more than 100 times as much energy in this waste as it originally produced, so fast reactors offer a way to both deal with nuclear waste and produce large amounts of low emission energy. It takes energy to make a power plant – to manufacture its components, mine the fuel, and so on. The power plant needs to make at least this much energy to be worthwhile. And it must also produce a surplus large enough to sustain the energy needs of a society – things like food production and hospitals, universities, transport and construction. So we must look at the energy returned on energy invested (EROEI) for our power sources. A break-even power plant has an EROEI of 1, and it is estimated that a modern developed society requires an EROEI of at least 7, meaning its energy sector should make at least seven times as much energy as it consumes. The most detailed calculations of EROEI were published earlier this year. Fossil fuels have an EROEI of about 30 – they yield a lot of surplus energy, which we have used for the past few centuries to build a complex industrialised global civilisation. Solar photovoltaic power is about 4 – better than break-even, but not enough to sustain a modern society. Wind comes in at 16, but that drops to 4 if energy storage is included. Solar thermal power with pumped hydro storage has an EROEI of 9, just barely making the economic threshold. It is the only renewable energy source to do so, when energy storage is included. Nuclear power is very energy dense, with an EROEI of 75. The EROEI for fast reactors has not been calculated, but it would be in the range of several thousand. Looking into the far future, to power a society similar to ours without fossil fuels, solar thermal and nuclear would be our options. While we’ll see a large increase in renewable energy, the big winner in the next few decades will be natural gas. But with total energy demand continuing to increase we are still not on track to a sustainable energy system, and we are moving to a world that’s 3–4°C warmer. Changed policies for dramatic increases in renewable energy and nuclear power, as well energy efficiency and carbon capture, are needed to change our course. And in the long run, when fossil fuels are just a part of our history, it will be the sun, and fast reactors, keeping our lights on.